A new product on the market in the UK, this really is a superb quality calf housing system. These hutches are designed with calf comfort and health as the priority. We offer three sizes of Vig-O-Comfort hutch to meet your needs and provide shelter from the elements in all weather conditions. What are the dimensions of the Vig-O-Comfort calf hutches? What are the features of the Vig-O-Comfort calf hutches? Cast in high density polyethylene (non-toxic, 100% recyclable) in a single piece. Resistant to shocks, ultraviolet rays, all weather conditions and cleaning products. Provided with a simple manual ventilation system. Easy to clean with the smooth inside coating. All hutches are provided with a long canopy, while with the front not being fully open this offers extra protection against all weather conditions so the comfort of the calf is ensured. The dimensions of our hutches are such that the calves can easily turn and move in the hutches. The effective leg space is sufficiently large with each model so the comfort of the calf is ensured. The doorways are sufficiently large to give easy accessibility for the farmer. 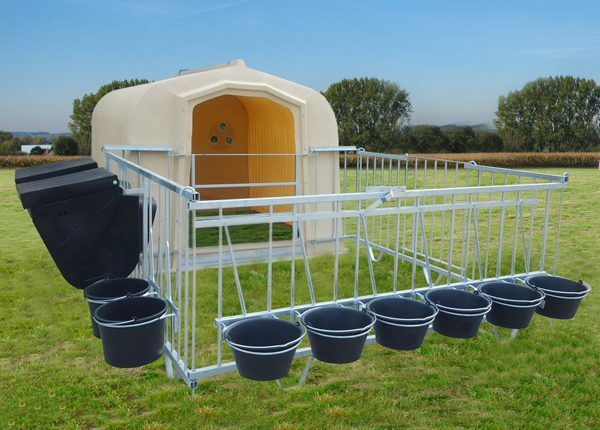 All hutches are available with a rainproof feeder for the provision of concentrate and hay. All hutches are available with soundly galvanised fencing with a door to offer easy accessibility. What colours is the Vig-O-Comfort available in? Beige: with a beige colour the hutch allows plenty of light through (no sunlight!) that is important during cold and overcast winter days, and the hut reflects the sunlight. One then has an insulating effect: cool in the summer and warmer in the winter. White: stronger reflection of the sun means the temperature can be kept low in the hutch during hot summer days (cooler than hutches made of polyester). Interested in a Vig-o-Comfort hutch? Download more information or get in touch!